The Delsey suitcase has been designed to provide the best possible protection for your items inside while being durable and lasting a long time. Founded in Paris, France, Delsey has designed a suitcase that is pleasing on the eye, all while staying classy and sophisticated. 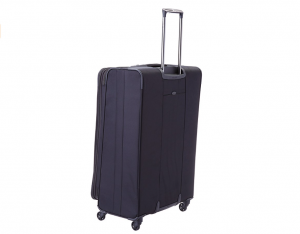 It is very easy to use, with the spinner wheels on the bottom of the suitcase, along with the telescopic locking handle and ergonomic grip, allowing you to glide through the airport effortlessly. 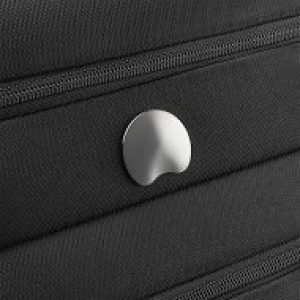 As with a lot of luggage brands today, the focus has been put on making it easier to travel with more items, and little features such as the handle on the bottom of the suitcase make this easier to do. The Delsey Luggage Helium Sky 2.0 suitcase is packed full of storage features that will make packing and unpacking a breeze. With three exterior pockets, you are able to store away any travel documents or essentials for easy access throughout your trip. There is soft-touch lining in the front pocket to allow you to store safely and easily any electronics for quick access when you need them most. Inside the suitcase, you will find a spacious main compartment fitted with tie-down straps that will ensure your clothing stays in place. Also inside you will find two zippered pockets for storing loose or valuable items in, along with a suiter clip to keep your suit crease free. One last thing you will find is a wet pocket, which is great for any items that are damp or can spill, stopping them from ruining the rest of your suitcase. 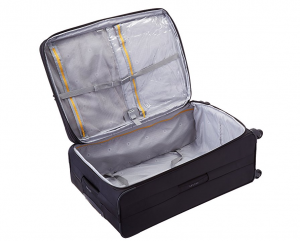 If you are looking for any more space inside this suitcase, it can be expanded a further two inches for extra packing capacity. You will find many modern features in and on the suitcase, with one of the most prominent being the durable micro ballistic material which offers great protection, while being hard-wearing. 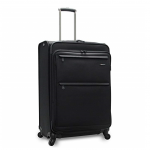 The spinner wheels found on the bottom of the suitcase assure smooth maneuverability and allows you to have little to no strain on your arm or shoulder. One of the other features that will make your life easier is the not often seen easy to grab bottom handle, which helps you pick it up and place the item in the trunk of your car, or even just getting the suitcase off a conveyor belt. The Delsey Luggage Helium Sky 2.0 suitcase weighs in at only 10.6 lbs, and although slightly heavier than the Steve Madden Tribal Luggage Large 29″ Expandable Suitcase With Spinner Wheels, it is still classed as lightweight considering the storage capacity and features that it possesses. 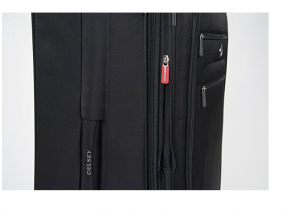 Delsey values the durability of their suitcases and is well known for achieving excellence when it comes to reliability.  They have designed the case with corner protectors along with a molded polypropylene kick plate which will eliminate wear at the major stress points. 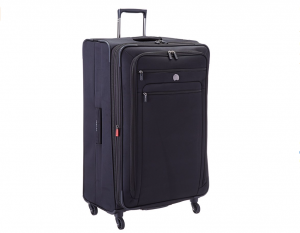 Having said that, some previous buyers have reported that the wheels are one of the weak points for the suitcase, and can feel unstable at times. Be careful with the wheels, and make sure not too much stress or strain is placed on them and they should last you awhile. The large suitcase comes in two colors, blue and black. In comparison to the Samsonite Centric 3 pc Hard side (20/24/28) Luggage Set, both are rather subtle and will not win any awards for creativity, yet look sophisticated and sleek in their design. The color coordinated zips handles, and detail ensures that it is stylish and attractive to look at. The suitcase is suitable for use in a professional setting due to its classic look, but also can equally blend in at a hotel resort on a tropical island. 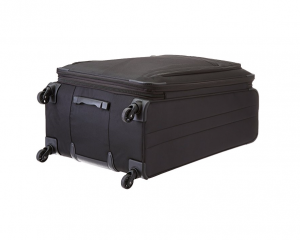 The spacious and sleek suitcase measures in at 29 x 19.5 x 11.5 inches, without taking into account the handles or wheels, which is a large size, yet easy enough to pick up and place in the trunk of your car. You can find larger suitcases on the market today, although questions remain over how big you actually need a suitcase to be. 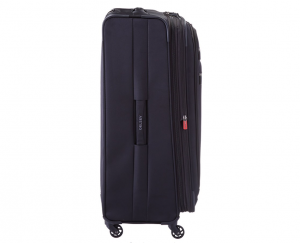 The Delsey Luggage Helium Sky 2.0, Large Checked Luggage, Hard Case Spinner Suitcase comes with a worldwide limited 10-year warranty, which will cover the suitcase for any material or manufacturing defects. It is worth noting that it does not cover any wear and tear issues or misuse, so take care of this suitcase and it should last you close to 10 years. Smart and stylish large checked suitcase! The Delsey Luggage Helium Sky 2.0, Large Checked Luggage, Hard Case Spinner Suitcase is a smart, sophisticated, and stylish suitcase that is suitable for both business and personal use. It is from the well-known brand Delsey, who puts great emphasis on durability and reliability, ensuring that your suitcase should last a long time if you take care of it.